MUMBAI, India – March 1, 2017 ViewSonic Corp, a leading global provider of visual solution products, in association with MZ Distribution will be participating in WHAT HIFI Show 2017 which will be held in Mumbai from 3rd – 5th March 2017. 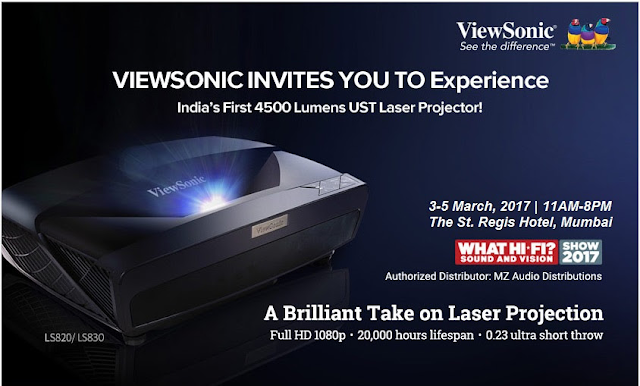 In the event, ViewSonic will be showcasing India’s first 4500 lumens UST Full HD Laser Projector and several other ranges of top notch quality projectors. We are pleased to be a part of such a biggest and longest running sound & vision show in the country. We being a global leader in visual solutions will be exhibiting ‘India’s First 4500 Lumens UST Full HD Laser Projector’, an ideal solution for modern business & education environments,“ said Eric Wei, Sales Director of ViewSonic Asia Pacific. “To experience first-hand what a difference our products can make in life as well as business, we invite you to be a part of a celebration of hi-end wide range of products that right-fits today’s requirements,” he added further. Featuring a stunning 1080p resolution and 4,500 Lumens of brightness, the ViewSonic® LS830 Laser Projector is the ideal solution for modern business and education environments. Designed with a laser phosphor light source, this projector delivers long-term, virtually free usage, lasting up to 20,000 hours. Additionally, its 0.23 ultra-short throw ratio, HV keystoning and 4 corner adjustments, the LS830 makes installation a hassle-free experience. ViewSonic Laser Projector LS820 without sacrificing on image quality offers an outstanding TV alternative at a substantially lower price tag than large format LCD displays. It features an ultra-short throw lens and this state-of the art projectors can be placed just 1.25 feet from the display surface to deliver an impressive 80-inch image. Rec.709 Cinematic Colors, ViewSonic SuperColor™ technology amps up image impact in LS820 with an exclusive color wheel design for rich, reliable and true-to-life color. Offering cinematic colors and crisp images, the ViewSonic LightStream™ Pro7827HD is the ideal projector for home theater entertainment. Featuring Full HD 1080p resolution and View Sonic’s Cinema SuperColor™ technology, this projector delivers incredible detail and brilliant color gradient coverage for a cinematic viewing experience. Delivering stunning 1080p resolution and 5200 lumens of brightness, the ViewSonic® LightStream® Pro8530HDL is the ideal projector for professional installations, large venues, and business and education environments. With its 1.6x optical zoom, centered lens, vertical lens shift, and HV keystoning, the Pro8530HDL provides extreme flexibility even in the most challenging installations.